Pubcrawl Tours in New York - Meet other people in New York by going to a pubcrawl. Want some tips on pubs, night clubs while you have a guide with you and get all served without much effort. 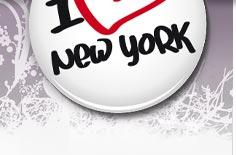 Book a tour of New York on any of the tours. Suitable for those who would like to visit a nightspot but perhaps never really come off when you have visited New York. Skip the line is is included when bookings of tours below. Really nice to meet new friends when visiting New York. Below we present a selection of tours focusing on the pub and nightlife. On this trip, visit a Brooklyn's contemporary brewery. You also visit a cathedral, you can try beer and a pizza lunch is included in the ticket. Your guide tells stories about Brooklyns German quarter and history. On this trip you will visit 3 different bars. You pass Times Square. A free drink is included in each place. Your guide tells about the Hells Kitchen area and the times when even the police dared to set foot in the neighborhood. Today, the area is trendy, exclusive and colorful. The trip takes about 3 hours. For those who want some guidance in the city to a lounge and a night club. The entrance is included, 2 free drinks and of course - skip the line entrance. Your guide will accompany you to both places. Put on your dance shoes and discover some of NY for a few hours. Departs from: 513 W 27 Street, nära 10th Avenue – "Ovest Pizzoteca"
Want to try cocktails and be guided to different bars in town - choose this trip. Stories around black clubs, gangsters, micro distillery and at the end you visit New York's premier wine and liquor store, Astor Wines. Buy something from any of the local distillers. The tour operates in the East Village area. 3 cocktails and light snacks are included. On this trip in Brooklyn you will learn a lot about craft beer. You can test about 10 different beers and some food. You visit several Brooklyn bars while telling your guide about beer making and the history of the island in the United States.